One question I've grown accustomed to answering is "Why Sandals?". The first time I had ever heard of Sandals, was when my now husband, Robert, and I had planned on taking our first vacation together. After doing much research, we decided on Sandals Negril in Jamaica. The only problem was, we knew we wouldn't be able to afford it on our budget, so we choose to hold off on our trip for three years until we could. No one could understand why we spent a year and a half saving up $5,000 to go on a trip that wasn't even our honeymoon. Everyone thought we were crazy for taking all of that hard earned money and spending it on a week at a resort in the Caribbean. They told us to "invest" or to "save" the huge chunk of cash we had been accumulating. But, once we returned they quickly realized, as did we, that every penny we saved was well worth it. Robert had told me all these stories about how he had visited a resort in Negril, Jamaica, called Beaches. He talked about how everything was included and how even though he was 13 at the time, he barely saw his parents the entire trip because he was so busy snorkeling, clubbing, swimming, playing sports, etc. He told me how crystal clear and calm the ocean water was, and how you could float there for hours on a raft, with a frozen drink in hand and just watch the sun go from one side of the sky to the other. Not a care in the world. It sounded impossible, as if he just couldn't seem to bring himself to the realization that it was only a dream he had years ago. But it was true, and it was real, and after doing some research we found the resort and learned that it has a sister property, just down the beach, that was for couples only. So, we got it in our minds that we'd visit this resort as soon as we graduated high school. The only problem was, it would cost more money than the two of us had ever seen in our lives. After graduation it was on to college, then finding an apartment to live in near campus, paying bills, and everything else that came along with adulthood. But in the back of our minds we knew if we saved our pennies we'd be on that beach we dreamed about every night. It took us three years to save up the $5,000, which covered our airfare; our transfers between the airport and resort; our room, which we decided had to be a concierge suite level because we wanted to have a ocean front room; all meals and drinks at any given time of day or night; and all activities and entertainment. 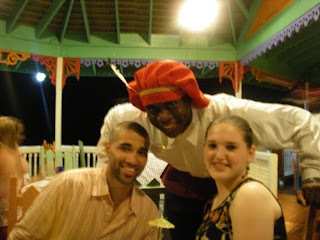 I still didn't fully understand the all-inclusive concept and expected to have to bring some extra cash to spend on tips, which we found out were already included and therefore not allowed at Sandals. Well, finally the day came. With passports in hand we headed to the airport. My nerves were shot. I hate flying, but I knew it would be worth it when we arrived. Finally, after a 4 hour flight we landed in Montego Bay. I wanted to cry from all of the excitement. From the moment we stepped off the plane everyone was above and beyond nice to us. 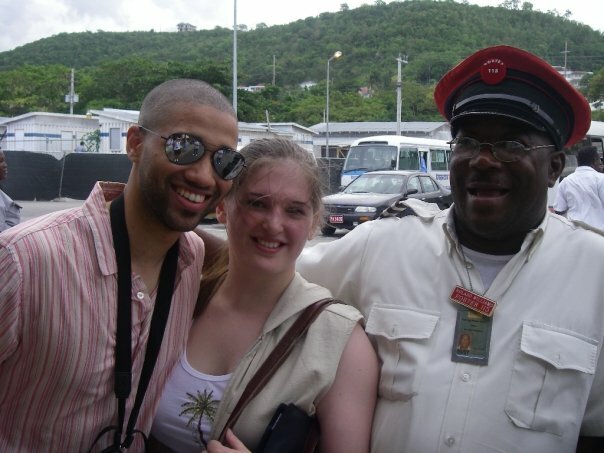 The customs and immigration workers were smiling and welcoming us to their beautiful island. We got our luggage and a porter immediately helped us. He took photos with us, told us a little about the island, and wished us a wonderful trip. The answer of "Why Sandals" was answered as soon as we left immigration. We walked into the open area of the airport, where there were what appeared to be a whole bunch of stores, except they weren't stores, they were lounges for the guests of different resorts. There were at least 10 or 15 of them. But the Sandals lounge impressed me the most. The decor was classic and modern, not the typical floral, Caribbean look, with all the crazy bright colors. Everything was earth tones and dark wood. There was a mini bar with beer and soda and water bottles. The bathrooms were spotless and well maintained. In fact, I was almost sad to leave when they called our names. The porter who had taken our bags as soon as we walked into the lounge was waiting outside with them, ready to go. Off to the resort. The drive seemed like it took hours, when in theory it really only took an hour and a half, but there was so much to see and our driver gave us so much information and history on Jamaica, I felt like I had just taken a guided tour! We pulled up to the resort, and until now we had only glimpsed at the ocean from the road, but I knew the color matched that of the photos I had seen, and already I was itching to put my bathing suit on. Walking into the lobby with at least 8 other guests, we were quickly met by a woman with two glasses of champagne. 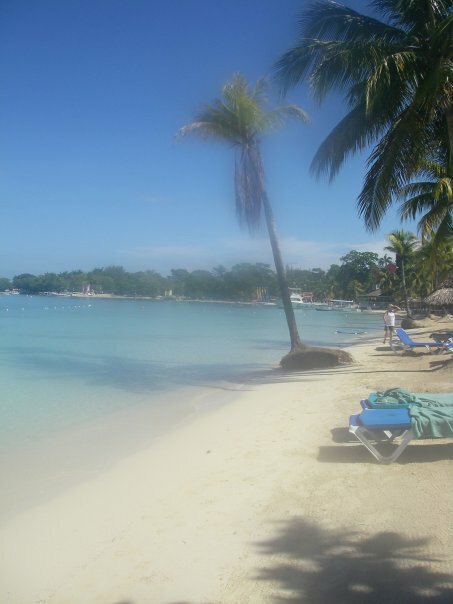 "Welcome to Sandals Negril Mr. and Mrs. Solomon! Please follow me. No need to worry about your bags, they will be waiting in your room for you". We weren't married, yet, but we didn't even bother to correct her. We were so busy taking in the beauty of the lobby. The swings for two hanging by the pool, the smell of the ocean, the sound of the waves. From the lobby we could see the beach and the woman led us away from the check in counter where the 8 other guests stood waited in line. I could tell they were envious as they watched us being personally escorted up the steps clearly marked "Concierge Guests Only", champagne in hand. They must have thought to themselves "what makes these two so special?" If they only knew that had they paid an extra couple hundred dollars they would be following us up the stairs. We followed the woman into the Concierge Lounge, where a man gave us cold towels and offered us more champagne while he checked us in. The whole process took no more than 5 minutes, and all we did was sit on the couch and sip champagne and watch TV. When we returned downstairs, room keys in hand the 8 couples were still lined up at the front desk. I was glad we paid the extra couple hundred of dollars. Check out was just as easy to. In fact, they did it all for you, you just showed up and dropped off your keys and you were done. No waiting in line! We walked out towards the beach, and found the view to be utterly breathtaking. At this point, I couldn't wait anymore. I needed to get into the room and put my bathing suit on. Between the heat, the traveling, the fact that a storm seemed to be rolling in, I was ready to jump into the ocean and spend a week just floating around relaxing. We made our way to our room, and found our bags waiting there for us. In fact, this is when I realized we hadn't seen our bags since we got to the Sandals airport lounge! What a nice added touch, not having to lug your bags all over a airport and resort! 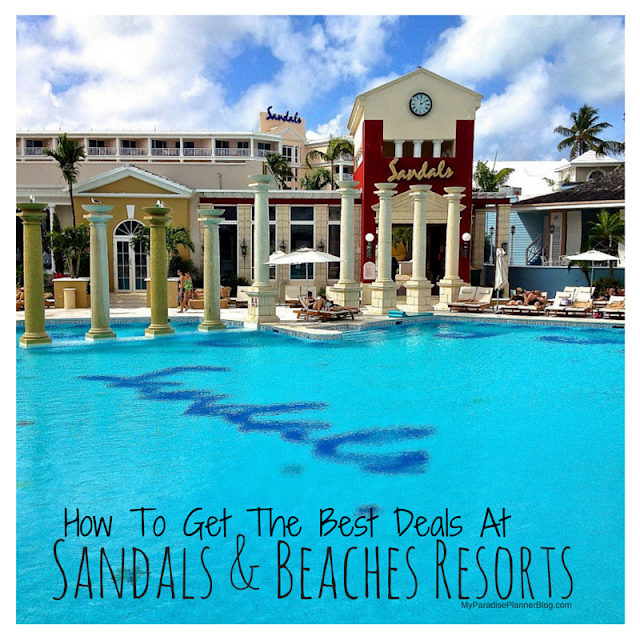 I was VERY impressed with how efficient Sandals was. They knew our names as soon as we walked in, which bags were ours, and they got them to our room quickly. They had a very good system and it really made a difference because we truly felt like we were important and being pampered. Upon opening the door, our jaws dropped. 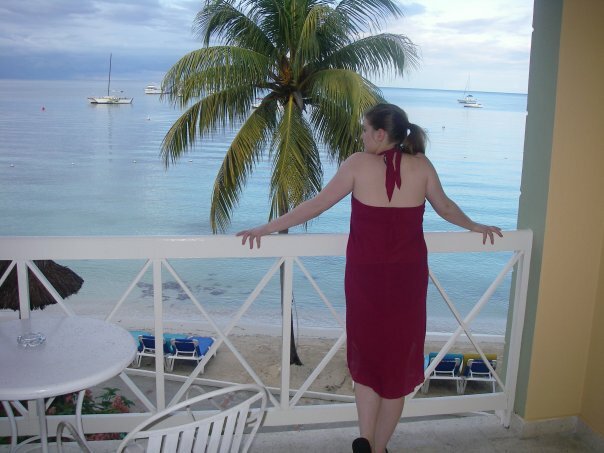 The very first thing we saw was the gorgeous blue ocean and the green palms of a palm tree outside our balcony. From the door, even from the bed, it looked like we were ON the water! We were that close. We once again stopped, took it all in. But it didn't take long before I was in my swimsuit and heading downstairs to jump into that beautiful water. I could have spent the entire trip in that water, but there was SO much to do. During our stay we joined in on pool volleyball, which was a blast; we watched the nightly shows; went snorkeling EVERY DAY a different snorkeling sites Sandals has access to. We tried water biking, kayaking, and other complimentary water sports. Anything they had, we did! The best part was, it cost us NOTHING extra. It was all included in the $5,000 we had already paid. By now we were eating and drinking like crazy, utilizing all the land and water sports, entertainment and more. I was starting to realize why the trip had been so expensive, and was now starting to realize what a good deal we were getting for that price. 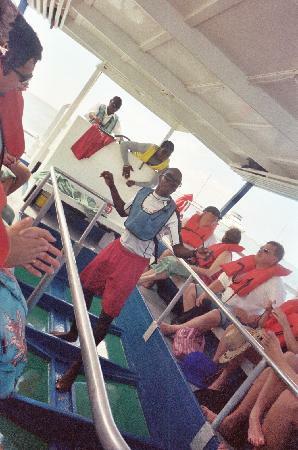 The snorkeling trips each day along would have ran us almost $1,000 by the end of the week! We still found time for some relaxing along the way. And we every morning we woke up to this view with the biggest smiles on our faces. We also met some wonderful employees at the resort. Each one of them were above and beyond amazing and to this day we remember them often and always fondly. But today, when I look back, the part of our trip that I consider the most amazing, was a night spent at dinner, with our bare feet in the sand, watching the sun set, and knowing we paid nothing extra for that life changing experience. 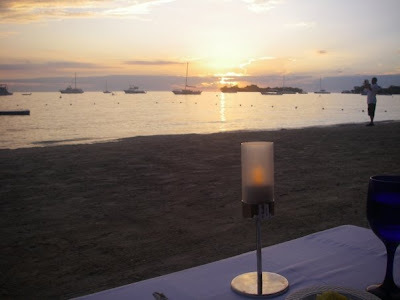 There is nothing in the world like sitting across from the person you love, watching the sun set perfectly over a ocean so calm all your hear is the whispered splash of waves against the same soft sand you're burring your toes into beneath the table. Then, when you're done, getting up and walking down the beach together hand-in-hand. No waiting for the check. No calculating tips. Nothing but freedom to do what you want, when you want, as much as you want, at no extra cost to you. That was exactly why we paid $5,000 and exactly why we chose Sandals. When all was said and done we would have easily spent $5,000 or more at another resort just paying for the room and food and all the extras to try and duplicate the experience what we experienced here. Years after our trip, I was still so inspired by the experiences Robert and I had at Sandals Negril, that I decided to become a travel agent. I wanted to make sure other people were able to experience the same amazing vacation we did. Since then, we've visited many other resorts throughout the Caribbean and Mexico, and one thing remains the same, they never compare to our trips to Sandals or Beaches resorts. The thing I am happiest about, is that we saved up our money and went to the right place. We could have easily scoured the internet looking for the cheapest deals out there, but I am so glad we didn't. We researched and found the right place that fit exactly what we wanted and we paid extra to have that because we weren't willing to compromise on things like a garden view room or a 2 star resort. For more photos from my trip, Click Here.